2013 Bodybuilding.com FIT USA Champion: Pierre Vuala! Pierre promised to stay the course no matter how hard it became and it paid off. Now he's the 2013 Bodybuilding.com FIT USA Fitness Model Champion! My journey dates back to elementary school. As a kid, I had no sense of food portions. If it was in front of me, I ate it. I was raised in a family where gluttonous eating was a form of endearment, which didn't help the situation. It caused me multiple doctor visits and endless teasing by friends, family, and peers up to my freshmen year in high school. It was apparent I had a problem that needed fixed before it spiraled out of control. I knew it would be hard to fix on my own, so I joined multiple sports teams to get the push I needed. I dropped fat and gained physical and mental strength, but most importantly, I developed a love for health, fitness, and competitiveness. I try to add two additional light ab days throughout the week and do cardio four times per week ranging from HIIT to low-intensity cardio for about 30-45 minutes. I like CrossFit occasionally because of its competitive and athletic functionality. It helps me with conditioning and humbles me. I'm going to start adding boxing into my routine soon. I'm a big fan of variety because training gets repetitive. This is my basic weightlifting split. When I got to a point where I considered myself fit, I promised that I'd never allow myself to go back to where I was before. That promise made me create the best body I could. The process of sculting the body I desire is an art. With every rep and set I think how my body will change. My biggest motivation to live a healthy lifestyle comes from my family. My parents suffer from health issues like high blood pressure and cholesterol and my brothers and sister eat everything microwavable. The more I educate myself on health and nutrition, the more my family will be health conscious and aware. Everybody has days when they don't feel like doing anything, especially breaking a sweat in the gym. When these days hit, I think of the guys out there training just as hard if not harder. 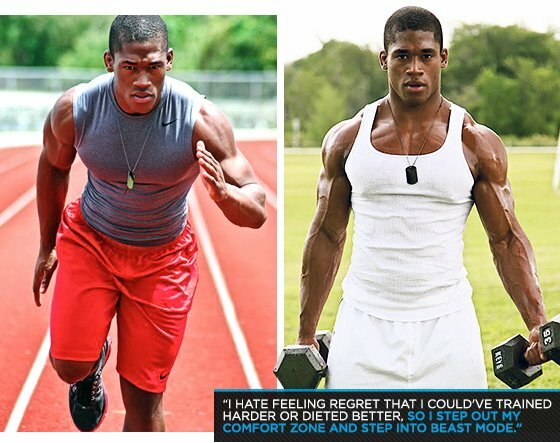 I hate feeling regret that I could've trained harder or dieted better, so I step out my comfort zone and step into beast mode. I want to compete on the Olympia stage in men's physique. I also want to be a top internationally-known fitness model, but not just for shoots and magazines, I want to be an inspiration. I love knowing that I can help someone reach their goals. I would like to work with or create an organization to fight childhood obesity. Nothing happens overnight. Anything worth it takes time, dedication, persistence, and resilience. The battle may seem long and never-ending, but when victory is reached it's that much sweeter. LeBron James is my favorite athlete. Besides that, he's currently the best player in the NBA. He's the face of resilience. When he left the Cavaliers to play for the Heat he was ridiculed and hated on. He took the Heat to three consecutive NBA finals and won the last two. Even though people bashed him, he still fought and proved them wrong. When I decided to compete, I had no idea where to start. 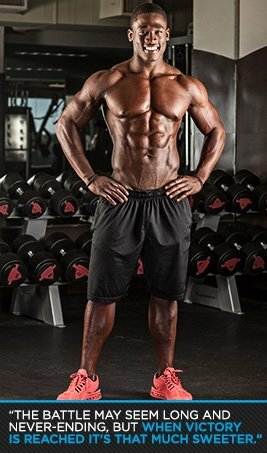 Bodybuilding.com's team is full of experienced athletes and coaches who write articles, so I found the information I was looking for from experienced competitors. Bodybuilding.com also has forums where members converse and ask similar questions.